Vanilla beans, milkfat, nonfat milk, sugar, corn syrup, salt, buttermilk, whey, mono & diglycerides, guar gum, polysorbate 80, locust bean gum, carrageenan and vitamin A. It takes a lot of time, dedication and the proper ingredients to achieve an authentic, classic flavor like vanilla ice cream. 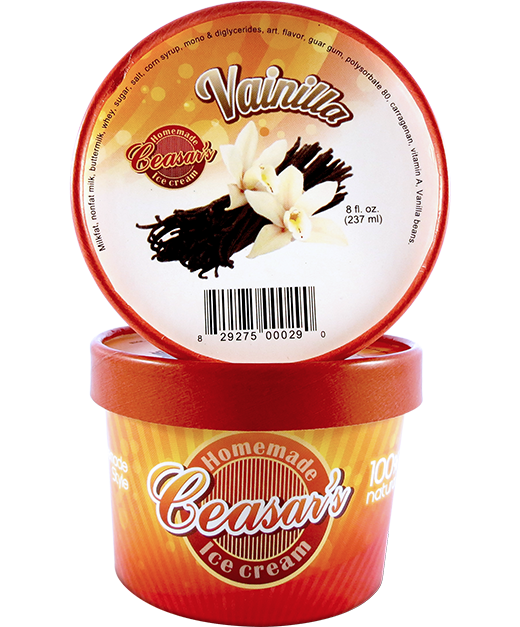 Its luscious texture and silky smooth consistency is what makes our Vanilla ice cream so beloved and far from boring. Whether enjoyed alone or loaded with toppings, this simple flavor is like a blank canvas that becomes the ideal base for any combination of flavors that your heart desires. Our homemade style Vanilla ice cream is made with pure vanilla bean and natural flavors, creating a texture so soft and dreamy that you simply can’t resist. Get ready to fall in love with our creamiest, most delightful Vanilla ice cream.